What happens next to foreigners, including Irish citizens, who went to live in the Islamic State (IS) is being debated here and around Europe on the basis that 'the war is over'. But the fight against IS was only one battle of many in the bloody Syrian civil conflict. The loss of the group’s territory is just the end of another phase – albeit an important one - in a war now in its ninth year. In the northeast of Syria where mostly Kurdish Syrian Democratic Forces (SDF), backed by the US, rolled up the final pocket of Islamic State territory in Baghouz, the ingredients of another phase of conflict are already in place. "Syria is still very much an unresolved conflict", says Aron Lund, fellow with The Century Foundation. "You still have a lot people in the country who hate and despise and fear Assad’s government. You have conflicts between Kurds and Arabs in the northeast. You have a disconnect between the Kurdish area and Damascus itself. You have the Turkish-Kurdish rivalry. You have all sorts of things that could go wrong up there." The former IS territory is too important to be left alone, says Randa Slim, Director of Conflict Resolution with the Middle East Institute. "The northeast is home to the major oil wells and agricultural belt of the country, so eventually the Syrian regime needs, for its own economic survival, to get control or reach an agreement with the Kurds, the Turks through the Russians to reassert control of the northeast. That’s somewhere on the horizon. How it’s going to come about is still not clear." For the moment, Dr Slim estimates the presence of 400 US troops will deter an all-out attack by the Syrian government and its allies on the area and stop Turkey attacking Kurdish forces. In the short term, that’s as close to stability as can be hoped for in that part of Syria. More than 6 million people are internally displaced by war in the country since 2011. Another 5.6 million people have fled abroad as refugees. The outlook for their return is not good. "The current situation throughout the Syrian Arab Republic undermines the feasibility of the return of internally displaced persons and refugees," said the UN in a recent report for the Human Rights Council. A particular area of concern, from a humanitarian point of view is Idlib in the northwest of the country. In 2015, Russian air power combined with existing Iranian military aid and Lebanese Hezbollah fighters to reinvigorate the Assad regime’s clawback of territory. Fighters and civilians from rebel enclaves were allowed flee to Idlib in series of truces. Idlib is now 90% controlled by Hayat Tahrir Al Sham (HTS). The UN-designated terrorist group has its roots in the Nusra front, Al Qaeda’s Syrian franchise. Three million people live in woeful conditions in the province, which is about the size of County Cork. Dozens of air raids have been carried out by Syrian and Russian bombers. Hospitals have been systematically targeted by pro-government forces to deprive civilians and militants of badly needed medical treatment, according to the UN. As well as external attacks, the UN report details how civilians in rebel-held Idlib also live in the crossfire of a turf war between rival armed groups. Millions of dollars in ‘taxes’ are levied by HTS on travellers on the main motorway routes. Vital humanitarian aid is diverted and sold at inflated prices. Arbitrary detention or worse is the price for protesting against the rule of HTS. Kidnaps by militant groups for ransoms of up to and above €100,000 are an industry in the province. Doctors, who are in short supply, are often the targets. At present, Turkish troops operate in outposts within Idlib. An agreement between Turkey and Russia last September saw the establishment of a demilitarised zone on the outer reaches of the province. Russia has committed to using its influence in Damascus to prevent a full-scale offensive. How long this can last is open to question. For the government of Bashar Al Assad, Idlib is unfinished business – an unacceptable terrorist enclave presenting a threat to neighbouring districts. 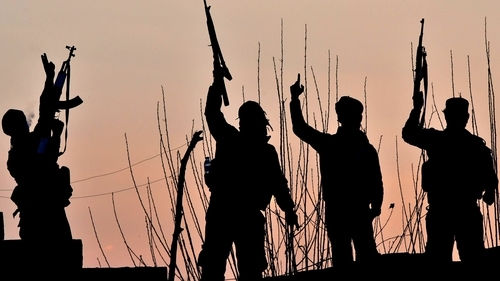 Russia wants to stop the escape of militants from the Russian Federation, particularly Chechnya, who are among the Islamist militants in Idlib. Turkey, which already hosts 3.6 million Syrian refugees, opposes an offensive that would drive more people across the Turkish-Syrian border. These priorities colour the various parties’ views of the best solution. There are competing views of what to do resolve the situation in Idlib: Do something or do nothing? Neither is good news for the area’s inhabitants. According to Randa Slim, the US and Turkey also fear an assault by government-allied forces on Idlib would be a repeat of the devastating battle for Eastern Aleppo in 2016 and act as a disastrous catalyst. "The US and the Turks have been arguing that is going to create support for ISIS and HTS and it’s going to create grounds for recruitment by extremist groups and lay the ground work for a long term extremist insurgency in the northwest part of Syria", she says. Instead, she says, the Turks and US favour a gradual, three-pronged approach of depriving HTS of its income generating road checkpoints; targeting them for assassination through rival Turkish-backed militant groups; and some precision strikes on HTS command centres. The counterargument is for a less gradual approach. "Damascus and Russia are arguing that, the longer we protract this extremist haven situation in Idlib, the higher the threat not only to other parts of Syria but also the higher the likelihood that operations targeting international centres, planned in Idlib by these extremist groups could then be carried out outside, whether in Turkey, Europe or Russia", Dr Slim says. According to Aron Lund, Turkey and Russia, without overtly saying so, might choose the ‘do nothing’ option: Sit tight, leave Idlib to "stew" and see what happens. "It’s also very possible that the area is left just as it is and then whatever happens internally to HTS and however the groups there split and reform and however Turkey manipulates that situation, you might end up with kind of frozen conflict situation where Idlib keeps existing as a rebel-ruled or jihadi-ruled bubble under a Turkish umbrella in an understanding with Russia." In other areas of Syria, the Assad regime managed to exploit differences between militants in rebel enclaves to slowly peel away militia groups on a piecemeal basis through contacts with fighters and community elders. Asked whether this could be repeated in Idlib, Mr Lund points out that this approach was neither an exclusively peaceful or diplomatic process. "In other places we’ve seen when that split [of rebel groups] eventually happened you had a segment of the population that accepted to live under Syrian Government control, that generally took place as a result of a military victory [by Assad]. It didn’t precede it." Among the other international players watching with concern as to what happens next in Syria is Israel. Its area of concern is the south of country. The growing influence of Iran within Syria has been one fear. Israel’s other fear is the role played by Hezbollah in the Syrian civil war, which provided it with eight years of combat experience, direct contact with its Iranian backers in Syria and access to the Golan Heights. These twin concerns led Israel to carry out air strikes on targets within Syria throughout the war. A recently established cell headed by a former Hezbollah member and one-time US detainee in Iraq was highlighted by Israeli intelligence last month. "Israel revealed that this terror network that exists now on the Golan on the Syrian side has been established without even the knowledge of Assad himself. [Israel is] basically arguing that increasingly decision-making on these kind of military intelligence operations are being carried by the Iranian Revolutionary Guard Corps (IRGC) and Hezbollah", says Randa Slim. This level of autonomous action by the IRGC in Syria is a particular issue for Israel, according to Dr Slim. "The major threat Israel sees in Syria is precision weapons production capacities that are being developed with IRGC assistance", Dr Slim says, the fear being that such weapons could be used by Syria or Hezbollah against Israel in the future. "A lot of the strikes that Israel has been conducting with benign neglect from the Russians have been targeting these facilities most of the time", she says. Military might has dictated what has happened to date Syria. That is unlikely to change in the short term. The notion that President Assad can be induced to take the path of diplomacy by the promise of reconstruction funding or other inducements, favoured by the EU, is not based on a realistic assessment of decision making in Damascus, Dr Slim says. She says the backing of Russia and Iran, along with pressure from his supporters not to compromise with a largely-beaten opposition is a more important calculation for Assad. "The regime is not going to do anything to upset that balance that they have, especially within their support base within the Allawite community. So linking reconstruction money to political progress makes sense to outside donors, to European governments but it has no currency or leverage among the power centres of the Syrian regime in Damascus."